Work may be dull, boring and probably drives you crazy, but that doesn’t mean your office’s look and feel needs to reflect this. You may not think you need the help, but almost every office space could use some stylistic improvement – after all, your office environment affects how you work, how you feel and represents who you are. Following are three simple tips from Sorting With Style’s Sayeh Pezeshki to improve any workspace, and boost both your mood and productivity as a result. Take a good hard look at your desk area. What do you see? Piles of papers and files scattered around? Receipts from last month’s lunch meetings? How about gum wrappers and coins in your paperclip holder? 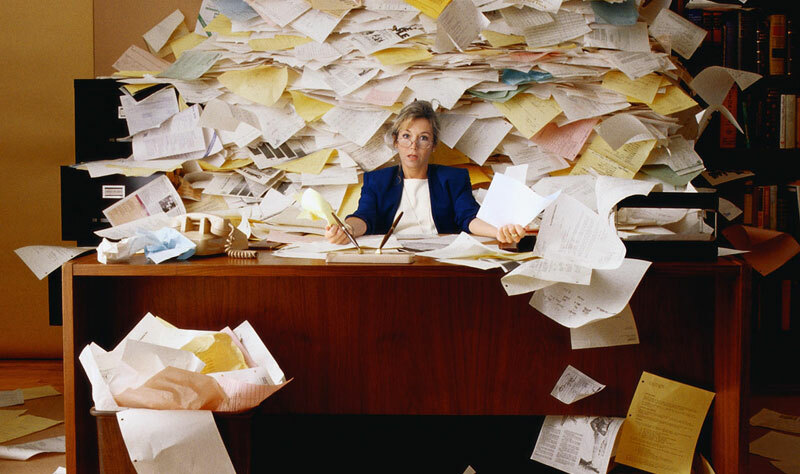 Knowing that a disorganized workspace often leads to distraction, perhaps it’s time to clear the clutter. Start by sorting things into piles, such as trash, file, and store. All the stuff you no longer need can and should be thrown away. As a general rule, if you don’t use it every day, it doesn’t belong on your desk. Printers and other large electronics besides a monitor should also be moved elsewhere. Files and other paperwork that don’t need to be within your constant reach should be where they belong. Got a thing for the color blue? Why not bring it to work? Pick a few personal items or colors that will help make your workspace more of “your space.” Keep in mind that you don’t want to go crazy with the color orange and paint walls, or hand out bright business cards. Choose things that are still office appropriate, but within your type of style to help brighten the day, and improve your mood while at work. Pick five things that you don’t care for and replace them with items you do care about, e.g. plastic pencil holders, boring mesh letter trays, chunky keyboards, ancient business card holders and more. Replace that business card holder with one you’d be proud to show and so on until eventually you’ve turned your workspace into a place that’s comfortable and inviting, where you’ll be more likely to enjoy your time and get things done.